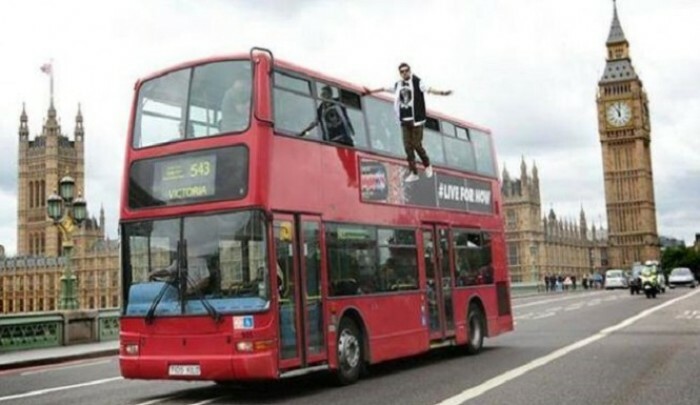 A levitating magician caused huge stir across the globe this past week after Dynamo, a UK-based magician, was seen floating alongside a red London double decker bus. A video of the levitating trick went viral on the Internet, amazing thousands of people across the globe. However, it now appears as though the method behind the levitating magic trick has been revealed. Magician Dynamo was spotted making his way past numerous famous London landmarks at he floated along next to the top of the red bus. Dynamo has not revealed the exact method he used for his levitating trick, however, other magicians and illusionists around the world have been weighing in, with some even suggesting that they have performed the same trick as they revealed how the amazing illusion is performed. A few potential methods for the trick have been touted, but the most likely seems to be that Dynamo's arm seen holding onto the bus in the trick is not his real arm, but a mechanical metal arm attached to the bus. Apparently the metal arm, goes down Dynamo's sleeve where it connects to a larger metal contraption, which goes down the back of his clothing and to his shoes, where a platform is created at the shoe area where Dynamo stands. The result is an illusion that gives the impression that Dynamo levitated up to the top of the bus and then magically floats alongside it. Spoilers have revealed that if viewers watch the video closely it can be seen that Dynamo's fingers never move in the clip. And the portion where Dynamo floats up to the top of the bus also happens when no onlookers are around the bus. The magic trick was performed by Dynamo for a Pepsi Max commercial, and judging by the huge publicity the stunt has gotten the commercial has been hugely successful for the company.